Step 2: Use standard 0.9% isotonic saline solution as your transport medium. Step 3: Prepare the surgical site. The preferred area is on the neck under the mane for cosmetic reasons. Shave the selected area with clippers and then a surgical blade to remove as much hair as possible. Use the sterile gauze to clean the area a disinfectant like Nolvasan. Apply a local anesthetic like Lidocaine to surgical site. Some horses may need mild tranquilization to perform this procedure. Step 4: If a biopsy punch is not available then perform an elliptical incision. Obtain approximately ¼ x ¼ inch portion of full thickness skin that can be sutured or stapled with one or two stitches. Try to maximize the amount of skin tissue and minimize the amount of adipose tissue and hair. Using sterile forceps, place the biopsy in bottle #1. Repeat the procedure and place in bottle #2. Step 5: If the animal is deceased collect muscle tissue instead of skin tissue. The muscle samples should be approximately 1/4 inch in diameter and at least 3/8 inch long. Step 6: Place the biopsy sample into the bottle of transport media and keep refrigerated until it is packed and shipped. Secure the lids on the bottles firmly. Step 7: Repeat the biopsy described in Step 4 above two more times until three sets of tissue samples are collected. Step 9: Place the tissue bottles in a Styrofoam box with ONLY ONE frozen ice gel pack (NOT DRY ICE). The samples need to be kept cold but not frozen. Place the ice gel pack on the bottom of the container. Separate the bottles from the ice gel pack with a layer of corrugated cardboard or Styrofoam to prevent the tissue samples from direct contact with the ice gel pack. The container should be capable of keeping the contents at temperatures between 35° and 45°F (2° to 5°C) for 72 hours. Check with your courier such as Federal Express or UPS for assistance and shipment times. Step 11: Please provide PERPETUATE the courier and tracking number by email (rdgille@gmail.com) or telephone (808-989-2028). 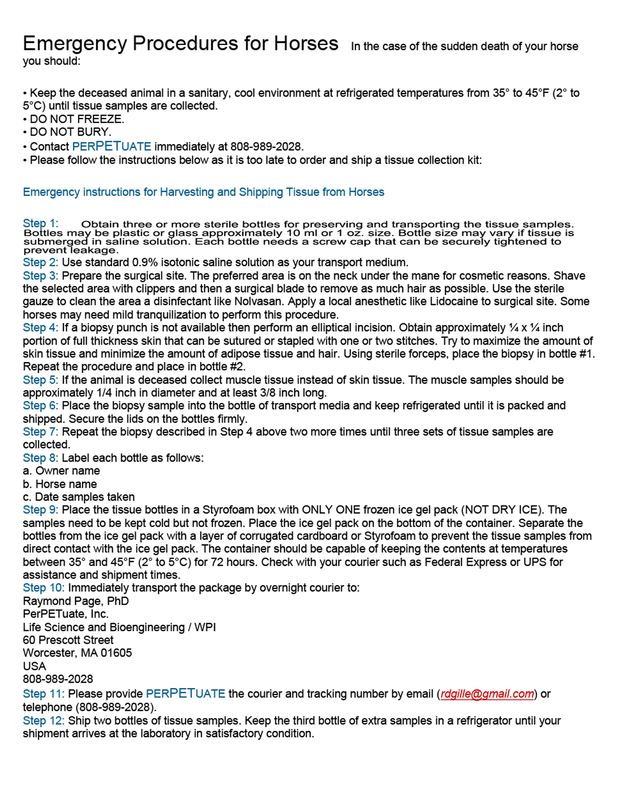 Step 12: Ship two bottles of tissue samples. Keep the third bottle of extra samples in a refrigerator until your shipment arrives at the laboratory in satisfactory condition.